Rae Mae is one of a few artists that will perform atop The Deck at the Moshulu at Penn's Landing. Guests on The Deck at the Moshulu are in for a new treat while dancing under the stars this summer. Open for its second season, The Deck offers live DJs a bar and special events. 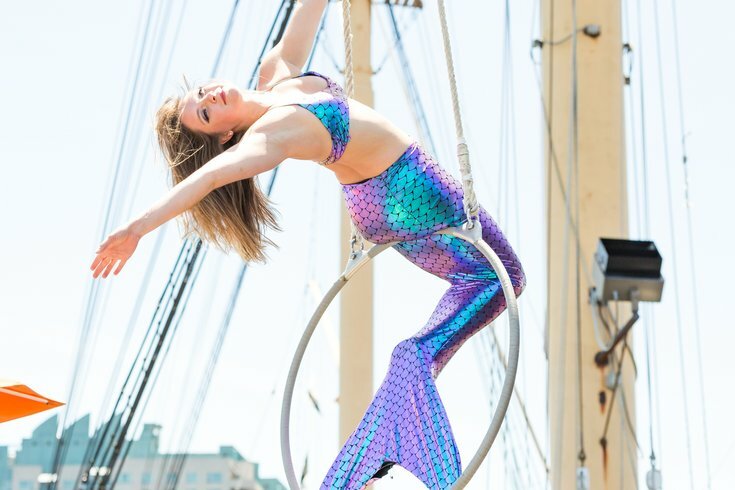 But beginning on June 16, an aerialist from the Philadelphia School of Circus Arts, dressed as a mermaid, will give free, 20-minute performances between 11 p.m. and 1 a.m. while suspended from the ship's yards. 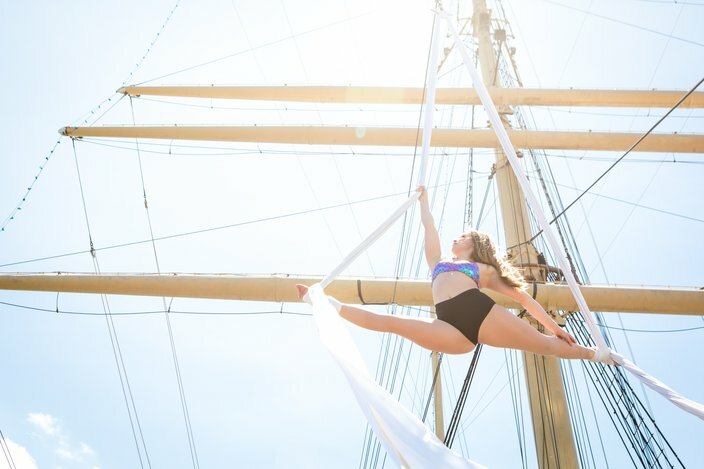 Rae Mae, an instructor at PSCA, will be the main aerialist performing on the lyra and on silks each Saturday night. 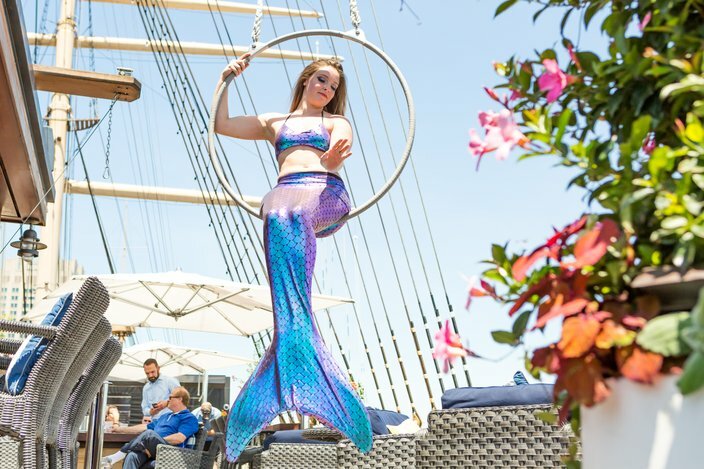 Other performances for guests attending The Deck will include circus arts and fire spinning. 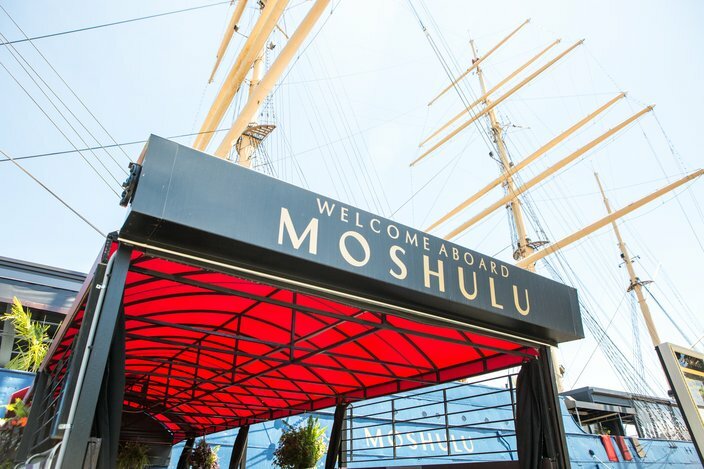 Located on the Delaware River, the Moshulu offers views of the Philadelphia skyline, Penn’s Landing and Benjamin Franklin Bridge, making it an ideal setting to catch a performance on a cool, summer night. Check out photos below from a recent preview performance of what you’re likely to see each Saturday night. 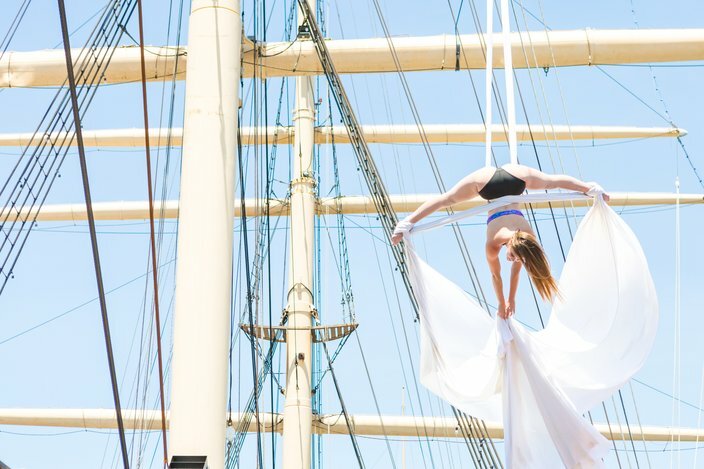 Aerial performer Rae Mae hangs from silks rigged to the yards of the Moshulu. Performances will be held every Saturday night and are free to everyone with admission to The Deck. A warm breeze from the Delaware River blows the silks from which Rae Mae is suspended as she performs Tuesday, June 12, 2018. Sun reflects off Rae Mae's mermaid tail as she performs on lyra atop the Moshulu, Tuesday, June 12, 2018. 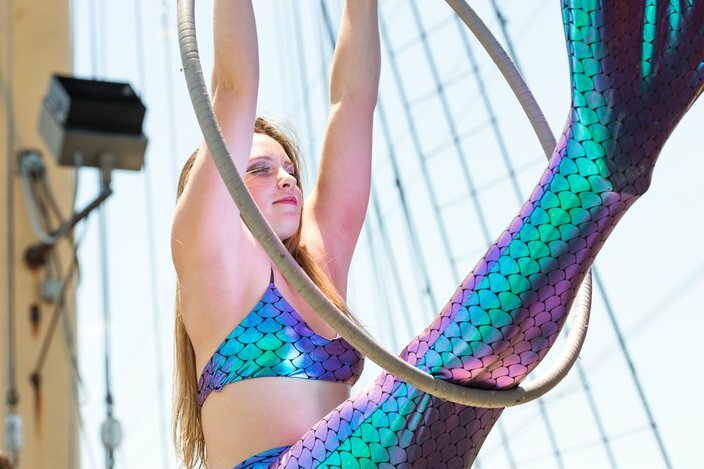 In addition to aerial silks and lyra, guests could also see a live fire spinning show and other circus performances. Performances will be about 20 minutes long between 11pm and 1am on Saturday nights. Rae Mae has been practicing aerials for about 6 years. See more of her performances on Instagram @RaeMaeCircus. 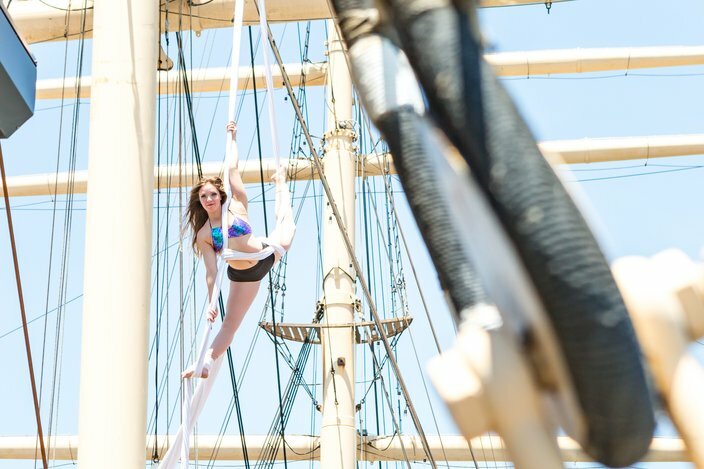 Rae Mae, an instructor at the Philadelphia School of Circus Arts, hangs from a wire tethered high above The Deck on the Moshulu as she performs on aerial silks. 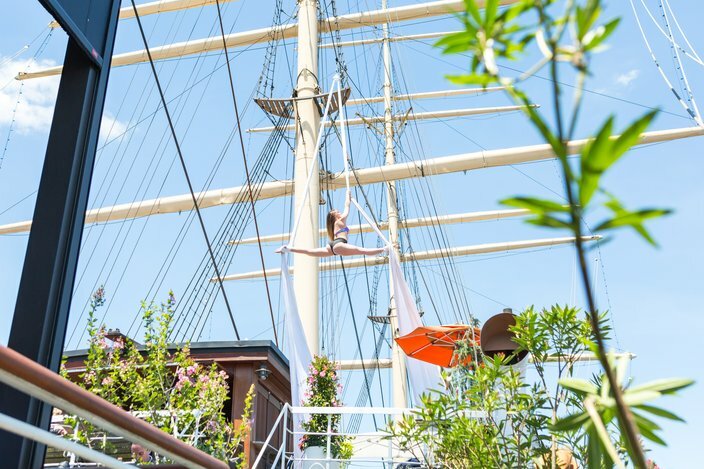 The Moshulu is docked on the Delaware River waterfront at 401 S. Christopher Columbus Blvd., next to Spruce Street Harbor Park.